May is Skin Cancer Awareness Month | Blog | Miami Skin Dr.
May is skin cancer awareness month. Most everyone is aware that exposure to the sun may have some impact on the probability of developing skin cancer at some point in their life. The sun is often times a scapegoat when it comes to the disease. However, in reality, sunlight exposure is not the only risk factor associated with skin cancer. Genetics also can play a role, and traits making someone more susceptible to it can be passed on. 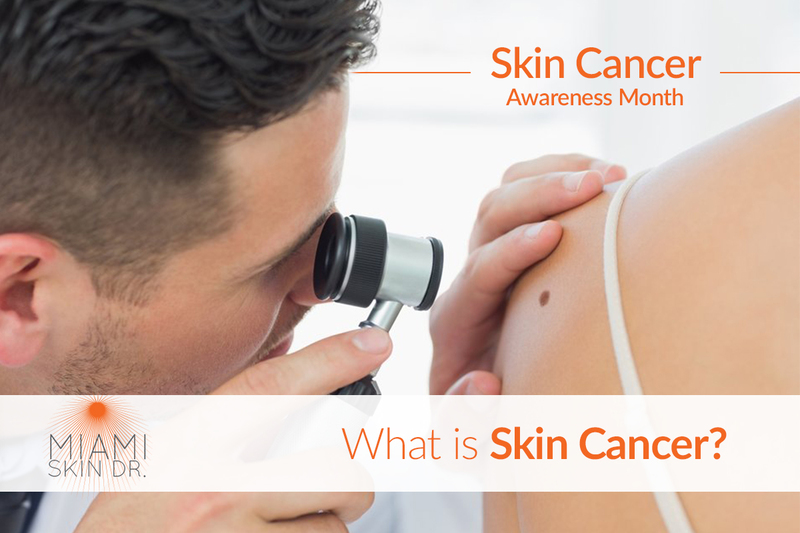 Knowledge and early detection are key in identifying types of skin cancers, and may even save your life. This month we will cover some of the important things you need to know about skin cancer and treatments that are available. To understand the symptoms of skin cancer, we must first ask, “What is skin cancer?” According to the Skin Cancer Foundation, skin cancer is a growth of abnormal skin cells that occurs when unrepaired damage to DNA in skin cells (often caused by ultraviolet radiation from sunlight or tanning beds) triggers mutations, or genetic defects, that lead the skin cells to multiply rapidly and form tumors. So what are the symptoms of skin cancer? Common belief is that skin cancer only occurs on skin that is most normally exposed to sunlight. There is a good deal of truth to this notion, but skin cancer can actually occur anywhere on your body’s epidermis. It most often takes the form of red or shiny white nodules, dark colored or crusted lesions, or brown colored spots that have recently appeared on your skin for seemingly no reason. A: Asymmetry – Is the growth symmetrical or asymmetrical? If you draw a line through the center do you get two equal halves? If not, this could be an indicator of melanoma and you should consult your dermatologist as soon as possible. B: Border – Benign moles are evenly bordered and often very rounded in shape. Malignant moles have more random borders and nebulous shape. C: Color – Benign moles are often a uniform color, a single shade of brown. Malignant moles tend to contain multiple shades of brown and melanoma may even show red, white or blue colors. D: Diameter – Benign moles are often smaller in diameter, whereas malignant moles are generally larger. E: Evolving – Benign moles maintain the same shape and color over time. If a mole starts to change color, elevation, shape, or size or take on new symptoms such as bleeding, it is most likely a sign of a malignant mole. As with any disease, early detection and treatment is critical. Skin cancer is often an unwanted surprise to the patients who suffer from it, so it is important to know your body. Give yourself regular examinations at home, while also keeping annual checkups with your dermatologist for full body examinations. Skin cancer signs should not be ignored. If you are suspicious of a mole for any reason, then it is better to have it checked out as soon as possible to ensure that, if it is malignant, it has as little time to spread as possible. Call our Doral, Aventura, or Miami Beach, FL location on 305.615.2440 or click here to schedule an appointment today! Why are Annual Skin Checks Important?